β-oxidation of long and very long chain fatty acyl-CoA derivatives occurs in peroxisomes, which are ubiquitous subcellular organelles of eukaryotic cells. This pathway releases acetyl-CoA as precursor for several key molecules such as cholesterol. Numerous enzymes participating to cholesterol and fatty acids biosynthesis pathways are co-localized in peroxisomes and some of their encoding genes are known as targets of the NFY transcriptional regulator. However, until now no interaction between NFY transcription factor and genes encoding peroxisomal β-oxidation has been reported. This work studied the interactions between NFY factor with the rat gene promoters of two enzymes of the fatty acid β-oxidation, MFP-1 (multifunctional protein type 1) and ThB (thiolase B) and their involvement in the cholesterol dependent-gene regulation. Binding of this nuclear factor to the ATTGG motif of the MFP-1 and of the ThB promoters was demonstrated by EMSA (Electrophoretic Mobility Shift Assay) and super shift assay. In contrast, in spite of the presence of putative Sp1 binding sites in these promoters, competitive EMSA did not reveal any binding. The promoter-dependent luciferase gene expression was downregulated by cholesterol in MFP-1 and ThB promoters harbouring constructs. This work describes for the first time a NFY interaction with promoter sequences of the peroxisomal β-oxidation encoding genes. It suggests that cholesterol would negatively regulate the expression of genes involved in β-oxidation, which generates the initial precursor for its own biosynthesis, via at least the NFY transcription factor. Fatty acid β-oxidation is with glycolysis one of the two major pathways providing cellular energy. Beta-oxidation of long and very long chain fatty acyl-CoA derivatives occurs in peroxisomes, which are ubiquitous subcellular organelles in eukaryotic cells . Although it is not linked with oxidative phosphorylation, peroxisomal β-oxidation of fatty acids releases acetyl-CoA, a precursor for several pathways such as cholesterol intermediate biosynthesis, including farnesyl pyophoshate and geranyl-geraniol pyrophosphate (required for ras protein membrane anchor) and for cholesterol production as well. Several reports indicate that peroxisomes would play a role in cholesterol synthesis. For example, data showing that a peroxisomal acetoacetyl-CoA thiolase which catalyzes the conversion of acetyl-CoA to acetoacetyl-CoA, known as a first step in cholesterol biosynthesis, has been reported earlier by Thompson and Krisans . Following this, several enzymes participating to cholesterol pathway have been co-localized to peroxisomes (i.e. HMG-CoA synthase, HMG-CoA reductase, mevalonate kinase and farnesyl pyrophosphate synthase) . In addition, defects in peroxisomes biogenesis, associated with Zellweger syndrome and rhizomelic chondrodysplasia punctata, reveal that in human liver mevalonate kinase and phosphomevalonate kinase are peroxisomal enzymes . Three enzymes are required for peroxisomal β-oxidation, the acyl-CoA oxidase, the enoyl-CoA hydratase/3-hydroxyacyl-CoA dehydrogenase, so called multifunctional enzyme-1 (MFP-1) and 3-ketoacyl-CoA thiolase (Th A and B). In contrast with numerous eukaryotic genes containing a CCAAT box at around -70 bp from the transcription start site, the in silico sequence analysis does not locate any CCAAT box in the proximal promoters regions of either rat MFP-1 or rat ThB genes. However, the rat MFP-1 promoter contains an ATTGG sequence at -92/-88, which corresponds to an inverted CCAAT box (figure 1). In addition, the rat ThB promoter contains two inverted CCAAT boxes located at nucleotides -60/-56 and-109/-105, respectively (figure 1). The inverted CCAAT motif is a functional cis-acting element present in promoters and enhancer regions of many eukaryotic genes including those encoding for two type I collagens, albumin, hsp70, major histocompatibility complex (MHC) class II and numerous cell-cycle-related proteins such as thymidine kinase and cyclins [5–9]. Although many nuclear proteins have been described to bind CCAAT elements, the heteromeric inverted-CCAAT binding transcription factor CBF or CP1, also called NFY [10, 11] appears to be the major factor recognizing a true inverted CCAAT box located in the -60 to -130 region of promoters . NFY is an ubiquitous transcription factor of 70 kDa resulting from the interaction of the three subunits A, B and C [13, 14], all of which are required to form a NFY-DNA complex . Tight association of NFY-B and NFY-C subunits is a prerequisite before recruitment of subunit A to the B-C complex leading to the binding of this heterotrimer complex to a specific DNA sequence . Primary structures of NFY subunits are conserved in mammals as deduced from the cDNA sequences of NFY-A, NFY-B and NFY-C among several species [6, 7, 15–17]. Human, mouse, and rat NFY subunits show more than 95% amino acid sequence identity . Portions of the amino acid sequences of mammalian NFY-A, NFY-B, and NFY-C are also evolutionarily conserved, with a high degree of sequence identity with segments of yeast HAP3, HAP2, and HAP5, respectively [16, 18, 19]. These polypeptides are components of a Saccharomyces cerevisiae CCAAT binding transcription factor which controls several nuclear genes involved in the mitochondrial function . The role of NFY has been demonstrated in the transcriptional regulation of genes encoding enzymes implicated in two major synthetic pathways: 3-hydroxy-3-methylglutaryl-CoA reductase and farnesyl diphosphate synthase for cholesterol biosynthesis, and acetyl-CoA carboxylase and fatty acid synthase for fatty acids biosynthesis [21–25]. Nucleotide sequences of the 5'-flanking regions of the multifunctional protein-1 ( MFP-1 ) and thiolase-B ( ThB ) genes respectively. Each transcription start site is numbered +1 and the sequence of Exon I are shadowed. Upstream nucleotides of this site are shown by negative numbers. The ATG codon encoding the first methionine is indicated in bold. Putative sequences for NFY and Sp1 motifs are shown. The current study reports that NFY binds to the proximal promoter regions of both the rat MFP-1 and the rat ThB genes. It suggests that cholesterol would negatively regulate the expression of genes involved in β-oxidation, which generates the initial precursor for it own biosynthesis, via at least the NFY transcription factor. In silico sequences analysis of rat peroxisomal genes encoding MFP-1 and ThB reveals the presence of inverted CCAAT boxes in both promoters, which are positioned from the transcription start sites at: -68/-64 for the MFP-1 gene and at -56/-60 and -105/-109 for the ThB gene (Figure 1). EMSA experiments were performed to determine whether liver nuclear factors interact with these inverted CCAAT boxes. The 115 bp probe corresponding to the positions -116 to -1 of the MFP-1 promoter region containing a putative NFY binding site and two putative Sp1 binding sites (Figure 1) was used in EMSA experiments. Incubation of the 115 bp probe with nuclear extracts resulted in the formation of two close protein-DNA complexes, a major one, complex I and a minor one, complex II (Figure 2A, lanes 1 and 6). These labelled complexes were competed by the unlabeled DNA competitor. Indeed, increased quantities of NFY25 oligonucleotide corresponding to the -76/-56 region (Figure 2A, lanes 2 to 5) completely abolished complexes formation for an excess of 500-fold. In contrast, complexes formation was unaffected by the use of the mutated oligonucleotide (NFY mut) over the same excess range (Figure 2A, lanes 7 to 10) confirming specificity of the nucleoprotein complexes association. These experiences suggested that the two shifted bands correspond to complexes joining of the -116/-1 region of the MFP-1 rat promoter, by binding to the pentanucleotide ATTGG sequence. These two bands could result from the existence of two isoforms of NFY-A subunit in the rat liver . A. Competition between the 115 bp MFP-1 fragment and two different competitors. Unlabelled competitor NFY25 (lanes 2 to 5) or NFY mut (lanes 7 to 10) was added to the radiolabelled DNA probe and the rat liver nuclear extract. Lanes 1 and 6 contain only a 115 bp radiolabelled fragment with the nuclear extract. B. Competition between the oligonucleotides NFY-1 or NFY-2 of ThB and different competitors. Unlabelled competitor NFY-1 (lanes 2 to 4) or NFY-1 mut (lane 5) was added to the radiolabelled DNA probe and the rat liver nuclear extract. Unlabeled competitor NFY-2 (lanes 6 to 9) or NFY-2 mut (lane 10) was added to the radiolabelled DNA probe and the nuclear extract. Lanes 1 and 6 contain only radiolabelled oligonucleotides NFY-1 and NFY-2 respectively with the nuclear extract. For the ThB promoter, incubation of two oligonucleotides corresponding to the NFY-1 or to NFY-2 motifs with nuclear extract leads to the formation of one main complex (Figure 2B). Despite a difference in complex intensity, similar mobilities were obtained for the probes corresponding to NFY-1 or NFY-2 sites. This labelled complex was displaced by adding unlabelled NFY-1 (lanes 2 to 4) or NFY-2 (lanes 7 to 9) competitors. However, it was unaffected with the corresponding mutated oligonucleotides NFY-1 mut (lane 5) and NFY-2 mut (lane 10). 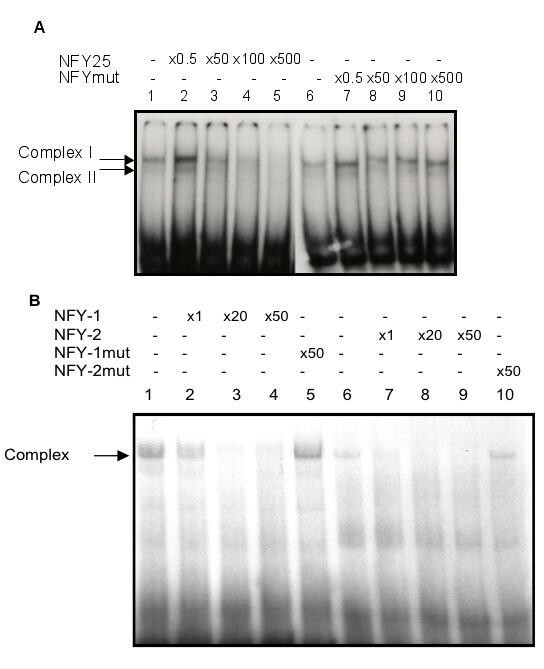 Super-shift experiment using a 132 bp PCR probe (-114 to +18) corresponding to the MFP-1 promoter was conducted to confirm the presence of NFY transcription factor in nucleoprotein complexes (Figure 3). This probe leads to the formation of two complexes (lane 2). The addition of the anti-NFY-B polyclonal antibody (lane 3) decreased the intensity of the two complexes observed in lane 2. Due to a weak concentration, the purified anti-NFY-B polyclonal antibody was less effective (lane 5). However the addition of the anti-NFY-A monoclonal antibody (lane 4) leads to the disappearance of the complexes. This latter monoclonal antibody targets the epitope localized at the C-terminus region of NFY-A known to be a conditional requirement for DNA binding activity . A control reaction with a pre-immune serum is shown on lane 6. The lack of complexes with anti-NFY-B antibodies possibly resulted either in the antibody binding to the NFY-DNA binding domain or in the formation of too large a complex to enter in the gel. Meanwhile, the two subunits seem to be involved in the nucleoprotein complexes. These data suggest that the inverted CCAAT box of MFP-1 interacts, at least in vitro, with NFY transcription factor. Super-shift experiments. 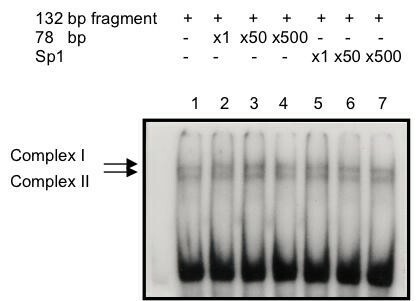 Lane 1: 132 bp fragment without nuclear extract; lane 2: 132 bp fragment + nuclear extract; lane 3: 132 bp fragment + nuclear extract + anti-NFY-B polyclonal antibody; lane 4: 132 bp fragment + nuclear extract+ anti-NFY-A monoclonal antibody; lane 5: 132 bp fragment + nuclear extract + purified anti-NFY-B polyclonal antibody; lane 6: 132 bp fragment + pre-immuneserum. Does Sp1 bind to the MFP-1 promoter (-114/+18 region)? The NFY binding site of the MFP-1 promoter is flanked by three putative Sp1 binding sites. To test the Sp1 protein binding, a 78 bp fragment overlapping two putative Sp1 binding sites at -55/-50 and at -37/-32 was used in competition with the 132 bp probe as well as a 22 bp probe containing a Sp1 consensus binding site. 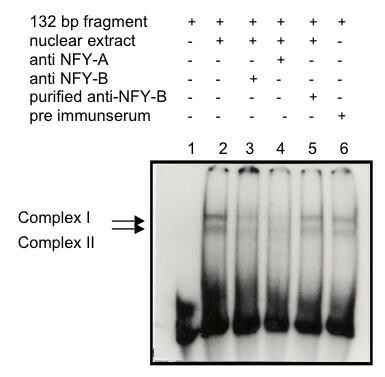 Therefore, the lack of competitive effect in shift assay of the 78 bp fragment or the Sp1 probe reveals the absence of nuclear proteins displacement towards the two complexes (complex I and II) that binds the 132 bp fragment (Figure 4, lanes 2 to 4 and 5 to 7 respectively). These results suggest that the Sp1 protein is not involved in formation of these complexes and the factors involved in the complexes observed (Figure 2A) especially bind to the region -114 to -56. Competition experiments between the 132 bp probe and the 58 bp fragment (-114/-56 region) confirmed this result (not shown). Competition between the 132 bp fragment and two different competitors. Unlabelled competitor 78 bp fragment (-60/+18 region of the MFP-1) (lanes 2 to 4) or Sp1 (lanes 5 to 7) was added to the radiolabelled 132 bp DNA fragment (-114/+18 region of the MFP-1) and the rat liver nuclear extract. Lane 1 contains only a 132 bp radiolabelled fragment with the nuclear extract. Since NFY is involved in the transcriptional regulation of genes implicated in cholesterol synthesis, such as the farnesyl diphosphate synthase, we used this gene construct as a positive control for the repressive effect of 25-hydroxycholesterol and cholesterol, which gives 94% inhibition (Figure 5). Thus, we checked for a regulation of the MFP-1 and the ThB gene expression by adding cholesterol into the medium. 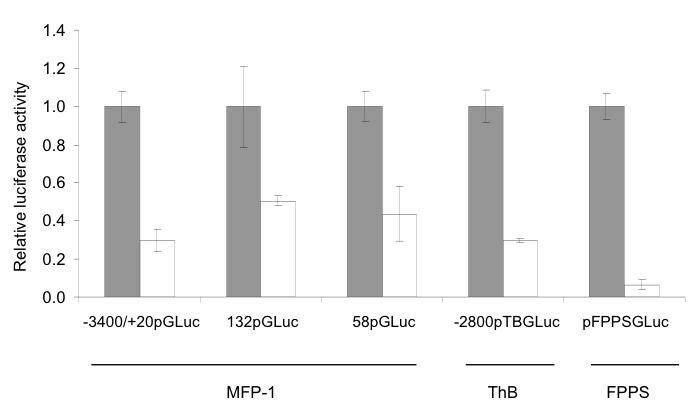 Luciferase reporter constructs containing the -3400 bp MFP-1 or the -2800 bp ThB promoter sequences upstream of the transcription initiation site (-3400/+20 pGL2 and pTBLuc) were transfected into HepG2 cells in presence or in absence of sterols for 48h. In addition to cholesterol, 25-hydroxycholesterol was used since it increases the intracellular cholesterol concentration and acts by blocking cholesterol efflux . Figure 5 shows that the promoter activity was down-regulated by cholesterol for the MFP-1 and thiolase B constructs (-70%). Effect of cholesterol on regulation of the MFP-1, ThB and FPPS promoter reporter genes. The HepG2 cells were transiently cotransfected (5 hours) with -3400/+20 pGLuc, 132 pGLuc, 58 pGLuc, -2800 pTBGLuc or pFPPSGLuc luciferase reporter plasmid and pCH110 β-galactosidase reporter plasmid and mock treated (filled bars) or treated (open bars) with 25-hydroxycholesterol+cholesterol (mixture) for 48 hours. The data represent the average of three independent experiments with the error bars. Luciferase activities were normalised according to the protein concentration and β-galactosidase activities. Relative luciferase activities are given, taking as 1 the activity obtained for each plasmid in the absence of sterols. Further transfection assays of the MFP-1 gene were conducted to locate the fragment involved in the cholesterol-dependent regulation in the -114/+18 promoter region. Two fragments were inserted upstream of the minimal β-globin promoter of the pGLuc vector ; the 132 pGLuc for -114/+18 fragment and the 58 pGLuc for -114/-56 fragment in pGLuc modified plasmid. Sterols induced a downregulation of the 58 and 132 bp fragments by 56%, and -49 %, respectively. From these results, it appears that the NFY sequence located in the 58 bp fragment is probably directly responsible for the repression by sterols, but other factors could be essential too. Among them, the SREBP transcription factor could be also involved due to its essential role in the cholesterol homeostasis. Indeed, the inhibition is more important with the complete promoter region (-3400/+20 fragment) (-70%) than with the 132 bp fragment (-49%), suggesting presence of cholesterol response element upstream to this region. In fact, seven sequences corresponding to a putative E-box are present in the first 500 bp of the promoter. Moreover, the binding of the SREBP-1 factor is 20 fold increased when the NFY factor is present [24, 25]. Such interaction may be involved in the transcriptional regulation of the MFP-1 gene by cholesterol. This work describes for the first time a NFY interaction with the promoter regions of genes encoding for peroxisomal β-oxidation enzymes and suggests its involvement in the cholesterol-mediated downregulation of the MFP-1 and the ThB genes. Control of the peroxisomal fatty acid β-oxidation would be involved in the peroxisomal cholesterol homeostasis. HepG2 cells (ATCC, Manassas, VA, USA) were grown as monolayers in Dulbecco's modified Eagle's medium (Gibco Life Technologies, France) supplemented with 10% (v/v) fetal calf serum (Sigma), penicillin (125 IU/ml) and streptomycin (125 µg/ml). Cells were grown at 37°C in a 5% CO2 atmosphere. Nuclear extracts from normal rat liver were prepared as previously described . Briefly, livers were freezed and crushed in liquid nitrogen. Tissue was lysed with buffer A (0.6% Nonidet P-40, 150 mM NaCl, 10 mM Hepes pH 7.9, 1 mM EDTA, 0.5 mM PMSF), homogenized with a Dounce homogenizer (Pestle B) and centrifuged at 1700 g for 30 s. The supernatant was incubated for 5 min on ice and centrifuged at 5000 g for 5 min. The pellet was resuspended in buffer B (25% glycerol, 20 mM Hepes pH 7.9, 420 mM NaCl, 1.2 mM MgCl2, 0.2 mM EDTA, 0.5 mM DDT, 0.5 mM PMSF, 2 mM benzamide, 5 µg/ml pepstatin A) and incubated for 20 min on ice. Sample was centrifuged at 13000 g for 15 s, and the supernatant was stored at -70°C. The protein concentration of nuclear extract was determined by Bradford assay  by using assay reagent (Bio-Rad Laboratories, France) according to the manufacturer's recommendations. The -3400/+20 pGLuc plasmid containing the promoter of the rat MFP-1 gene  was digested with Aat II and Bgl I endonucleases (Promega, France) to obtain a 115 bp fragment (-116/-1 region), with a putative NFY binding site. 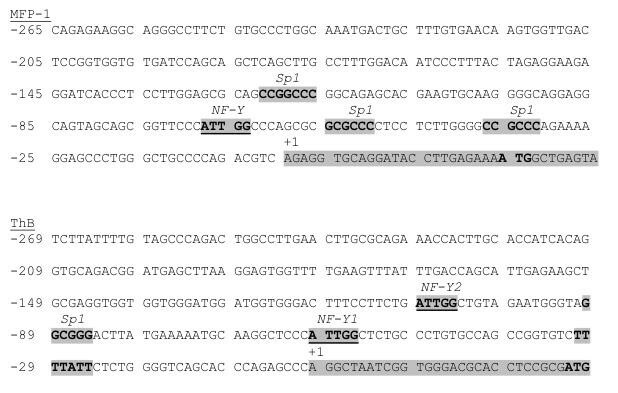 DNA fragments of different proximal promoter regions of the MFP-1 gene were also obtained by PCR with a combination of four primers, 115S (sense) (5'-GTAGATCTGCAGAGCACGAAGT-3'), 115A (antisense)(5'-AGAAGCTTAAGGTATCCTGCACCT-3'), P76S (sense) (5'ATAGATCTAGCGCGCGCCCC T-3') and NF60A (antisense) (5'-ATAAGCTTCGCTGGGCCAAT-3'). To obtain a 132 bp fragment (-114/+18 region) containing putative NFY and 2 Sp1 binding sites, PCR was run for 35 cycles (94°C for 30 s, 50°C for 45s and 72°C for 3 min) with primers 115S/115A. For the 78 bp fragment (-60/+18 region) containing 2 putative Sp1 binding sites and the 58 bp fragment (-114/-56 region) containing a putative NFY binding site fragments, PCR was run for 35 cycles (94°C for 30 s, 47°C for 45 s and 72°C for 3 min) with primers P76S/115A and 115S/NF60A respectively. Amplification was performed using the 3400/+20 pGLuc plasmid as template in 10 mM Tris-HCl buffer, pH 9, 50 mM KCl, 0,1% Triton X-100, 3.12 mM MgCl2, 50 pmol of each primer, 2 mM dNTPs (Promega) and 1 U of Taq DNA polymerase (Promega) in PTC-100™ thermocycler (MJ Research, Reno, NV, USA). PCR fragments were inserted into pGLuc modified plasmid  between Bgl II and Hind III sites to obtain the 132 pGLuc and 58 pGLuc plasmids. The ThB promoter (-2800 base pairs upstream the transcription initiation site, Hind III / Eco T22I promoter region) was inserted at the Hind III site of the pGVB plasmid upstream of the luciferase gene (-2800 pTBLuc) . For the farnesyl diphosphate synthase promoter, a 723 bp sequence (-770 to -47 region upstream the translation initiation site) was inserted upstream to the luciferase gene in the reporter vector pGL2 (pFPPSGLuc) according to C. Le Jossic-Corcos (unpublished results). Oligonucleotides (Invitrogen, Cergy Pontoise, France) used as competitors in the electrophoretic mobility shift assays include two complementary 27 bp wild-type oligonucleotides (NFY25) corresponding to the -76/-56 region of the MFP-1 promoter containing the ATTGG motif with additional nucleotides representing of 5'Bgl II and 3'Hind III half sites and two complementary 27 bp oligonucleotides (NFY mut) corresponding to the same region with a mutated ATTGG motif to CGGTT. For the NFY binding sites of the thiolase B gene, four wild type oligonucleotides, NFY-1 (30 bp) and NFY-2 (28 bp), corresponding respectively to the -70/-46 and -118/-95 region of the thiolase B promoter with the ATTGG motif with additional nucleotides representing of 5' Hind III and 3' BamH I half sites and four oligonucleotides NFY-1 mut (30 bp) and NFY-2 mut (28 bp) sense and antisense corresponding to the original sequences of the thiolase B promoter with a mutated ATTGG motif (CGGTT) were used. Moreover, two complementary 22 bp oligonucleotides (Sp1) containing the consensus binding-site of the Sp1 factor were purchased from Promega. Labelling was performed with 50 mM Tris-HCl, pH 7.5, 10 mM MgCl2, 1 mM DTT, 0.05 mg/ml BSA, 5 pmol DNA (132 or 115 bp fragment), 10 µCi [a-32P] dCTP (3000 Ci/mmol, Amersham, Saclay, France), 20 U DNA polymerase I (Klenow fragment, Promega) and 500 µM each of dATP, dGTP and dTTP (Promega). Reaction was incubated for 45 min at 30°C and then stopped by addition of 0.5 M EDTA, pH 8. Radiolabelled probes were purified on Sephadex 50 column (Pharmacia) . DNA-protein binding reaction contained 10 mM β-mercaptoethanol, 5 mM EDTA, migration buffer (0.01% bromophenol blue, 30% glycerol and 5 mg/ml BSA), 1 µg poly [dI-dC], 1 µg sonicated DNA salmon sperm, 20 µg of rat liver nuclear extract and buffer (0.01 M Tris-HCl, pH 7.1, 0.1 mM EDTA pH 8, 0.08 M NaCl, 3 mM MgCl2, 0.1% Triton X-100, 5% glycerol). The radiolabelled probe (20000 cpm) was added and reaction was incubated for 30 min at 4°C. Reaction was separated on 5% native polyacrylamide gel electrophoresed for 15 min at 5 mA and 40 min at 10 mA. Gel was incubated for 15 min in 5% glycerol, dried for 30 min at 80°C, and exposed overnight at -70°C to a Kodak film (X-OMAT AR). HepG2 cells (7.104 cells/well) were plated on 24 wells plate in DMEM with 10% lipoproteins-deficient fetal calf serum (Sigma). Cells were transiently transfected using lipofectine (Gibco) with reporter constructs (-3400/+20 pGLuc, 132 pGLuc, 58 pGLuc, -2800 pTBLuc or pFPPSGLuc) and an internal control (pCH110 plasmid encoding β-galactosidase, Pharmacia). Cells were incubated for 5 h in optimem (Gibco) and then for 48 h in the absence or presence of sterols (10 µg/ml of cholesterol and 1 µg/ml 25-hydroxycholesterol). Cell extracts were prepared with lysis buffer of the luciferase assay kit (Promega) and assayed for β-galactosidase (Galactolight kit Tropix, Applied Biosystems, Courtaboeuf, France) and luciferase activities (luciferase assay kit, Promega). The protein concentration (Bradford assay) and β-galactosidase activity were measured in each sample and values were used to normalized luciferase activities. We thank Dr. Mantovani (University of Milano, Italy) for providing NFY-A and NFY-B antibodies. We thank Dr. Laurent Corcos for his valuable discussions. This work has been supported by the Regional Council of Burgundy, IFR n°92 and by the GDR-CNRS n°2583.